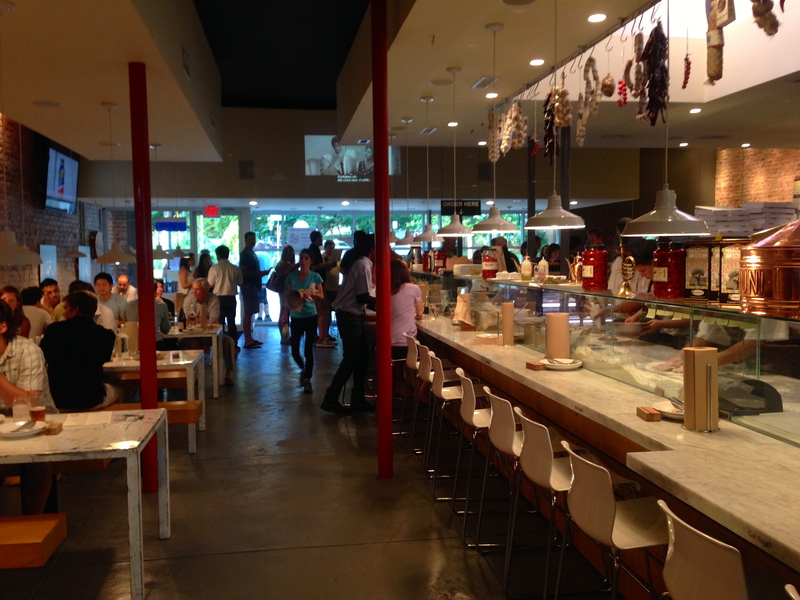 Atlanta is at war–pizza wars, that is, and this war is wood-fired. Tile pizza ovens have sprung up all over the city. From Antico on the Westside to Double Zero in Sandy Springs to Ammazza in the Old Fourth Ward, you can get your fill of Neapolitan-style pies wherever you are. 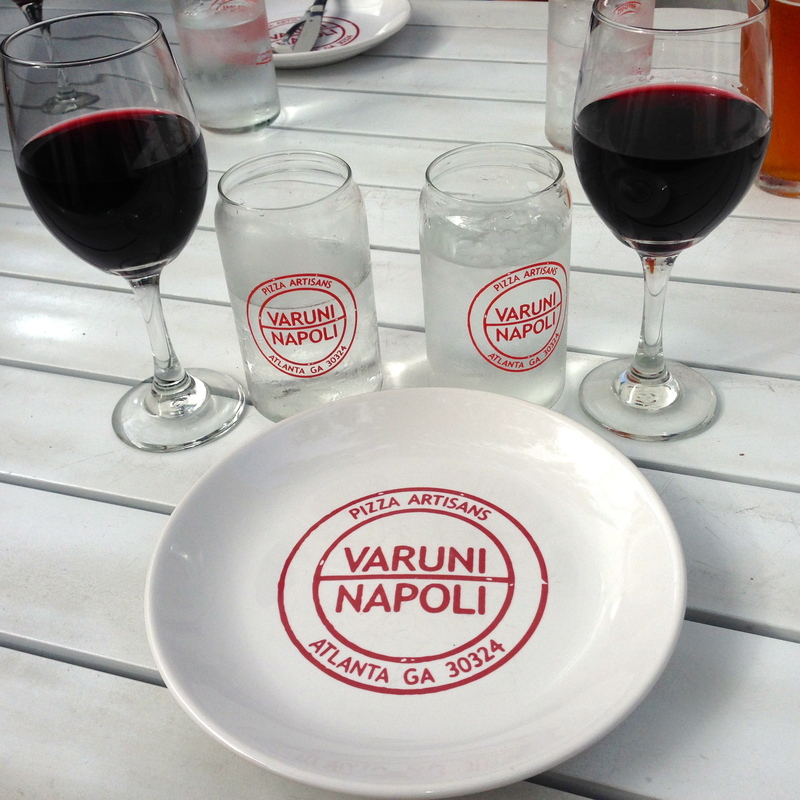 Date Night throws more wood on the fire as we visit Varuni Napoli, located near Ansley Mall. From the street, Varuni is hard to find. This is what it looks like at from the front. The signage in the rear is much better. Varuni does not open until 5:30PM and we are a bit early, so we cross a busy Piedmont and Monroe to an Atlanta institution. 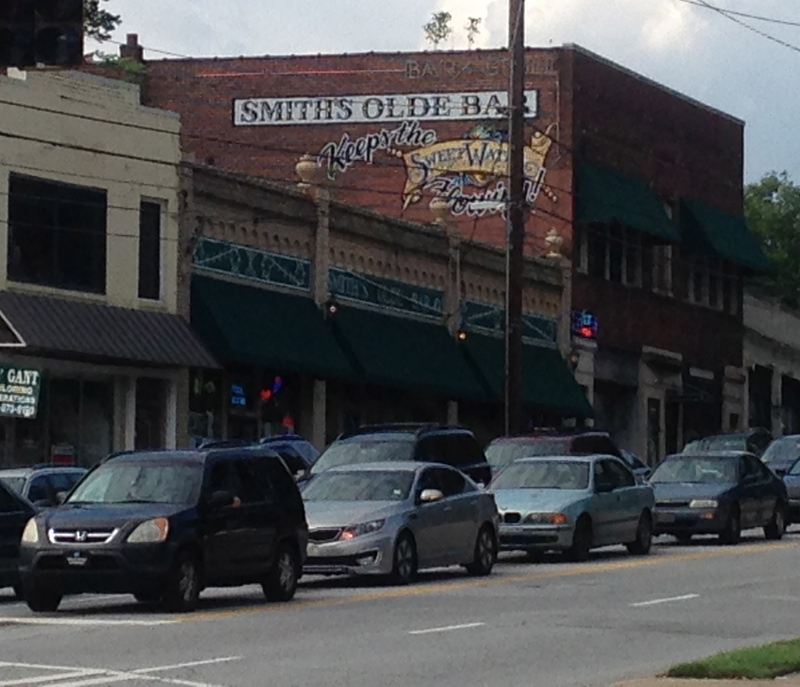 Smith’s Olde Bar has been here forever. A look inside tells the story of the last 40 years of music in Atlanta. 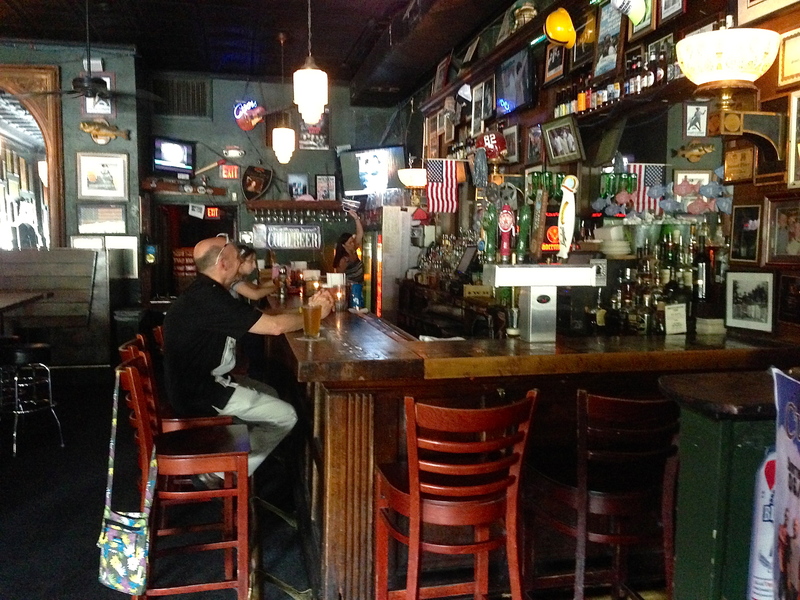 If your musical roots are in the ATL, your band probably played here. We are joined tonight by “date crashers” Chris and Shawn, who happen to live a couple of blocks away and knew we were in the neighborhood. It’s nice to have them with us–Chris joined Date Night back in May at Cypress St. Pint and Plate and Shawn is making his first Date Night appearance. I make two attempts to order a Starrs Mill beer, both which are rejected because the taps are out. Hey, it’s Friday, why have all of your taps full? The bartender is not very friendly, so this is going to be a short visit. I finally get the Starrs Mill IPA because someone goes upstairs and pours me one. It’s nice and hoppy, but not bitter. Eve gets the wheat beer from the same brewery in Virginia. It’s a nice wheat and certainly a mild contrast to my IPA. Meanwhile back across the street at Varuni, let’s see what’s on the menu. Pizza perhaps? 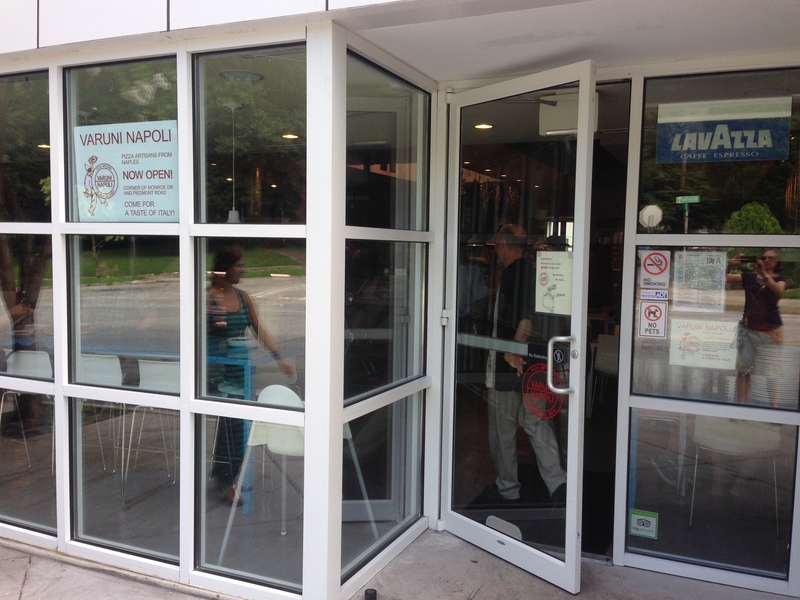 You order from the counter and the friendly folks back there help you if you are a novice. You can’t substitute pizza toppings, but you can leave things off. You get a number and one of many servers brings you the food. 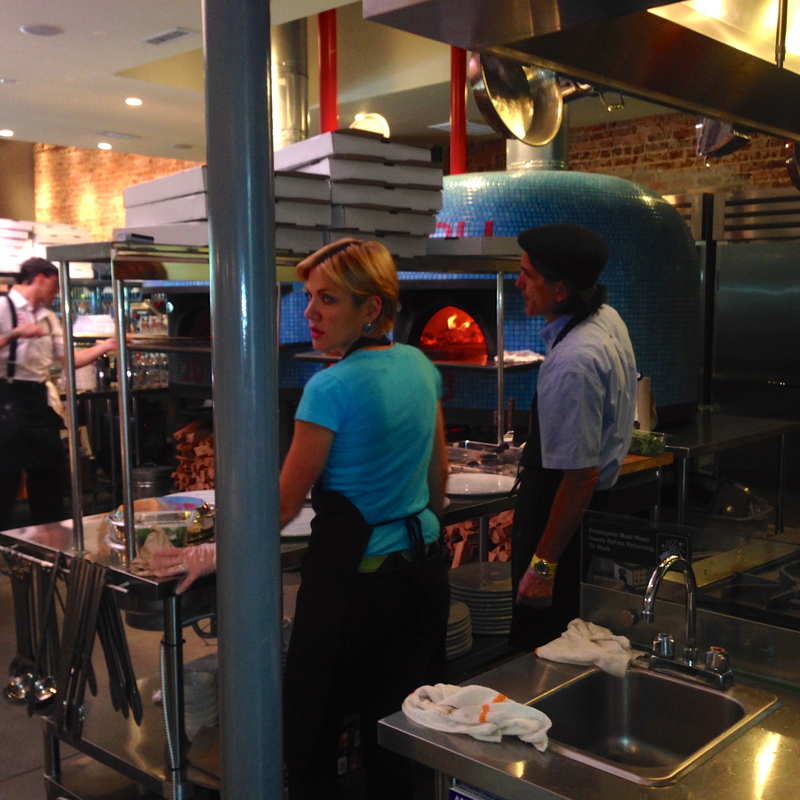 There are two, big and blue Italian pizza ovens. 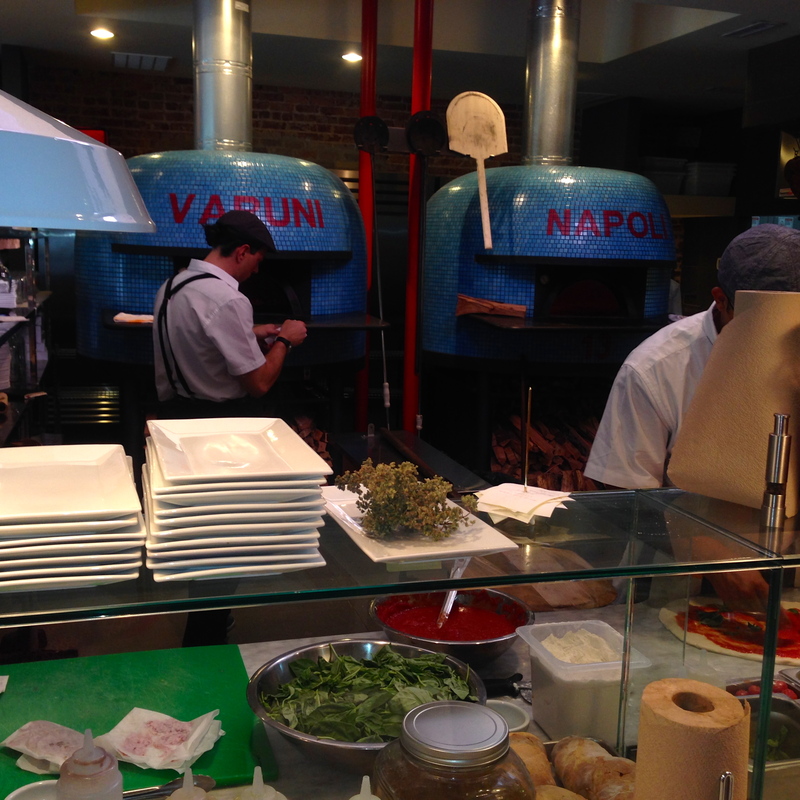 Owner Luca Varuni used to work at Antico, and we expect the pizzas to be similar. Varuni is often seen working the dining room. We don’t meet him tonight, but hear that he is very entertaining. There’s a lot of activity going on back there. There are seats at the kitchen so you can watch the action. You can sit in the loud dining room. It’s loud because at this early hour it’s full of kids and the sound carries a lot in here. The back room is much more quiet. It’s cooling off, and we decide to sit on the deck. How’s this for branding? We order a couple of glasses of Italian wine because it’s only $5 a glass. Such a deal! First out is the Varuni salad, greens with pecans, heirloom tomatoes, prosciutto and vinaigrette. It’s a nice start to the meal, but something bigger is on the way. Say hello to the Amore Mio. It’s Date Night and we have a plate full of Italian “love”. 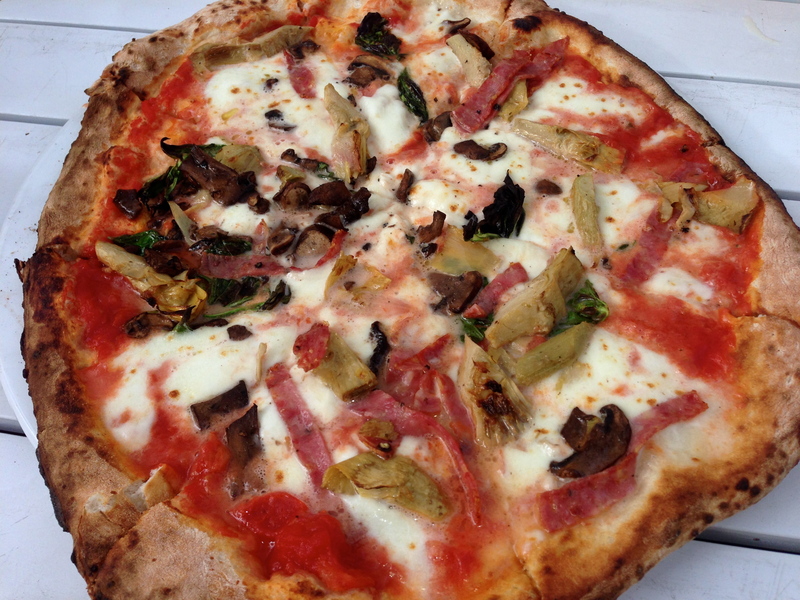 Fresh mozzarella, artichokes, soppressata, mushrooms, olives and basil are all cooked in that wood-fired oven. 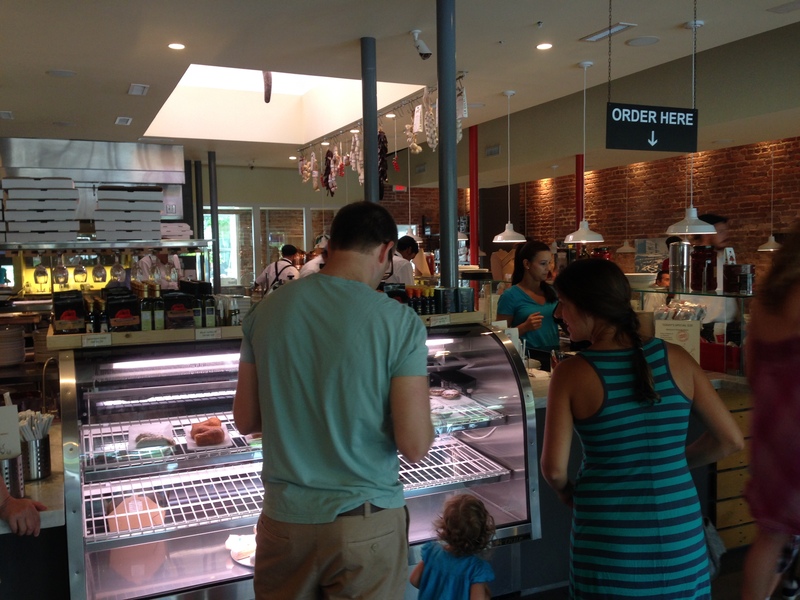 As with all Neapolitan pizza in Atlanta, it must be compared to Antico. The crust is thinner, and there is more topping at Varuni. The service and atmosphere is better here too. Here’s a shot of Chris and Shawn’s pizza, the Porreca Picante. This pie has fresh mozzarella, hot salami, hot pork sausage, hot peppers and basil. This is one spicy pizza. I think Chris breaks out in a sweat while he’s eating it. It may be too spicy for him, but Shawn is very happy and there are no leftovers. 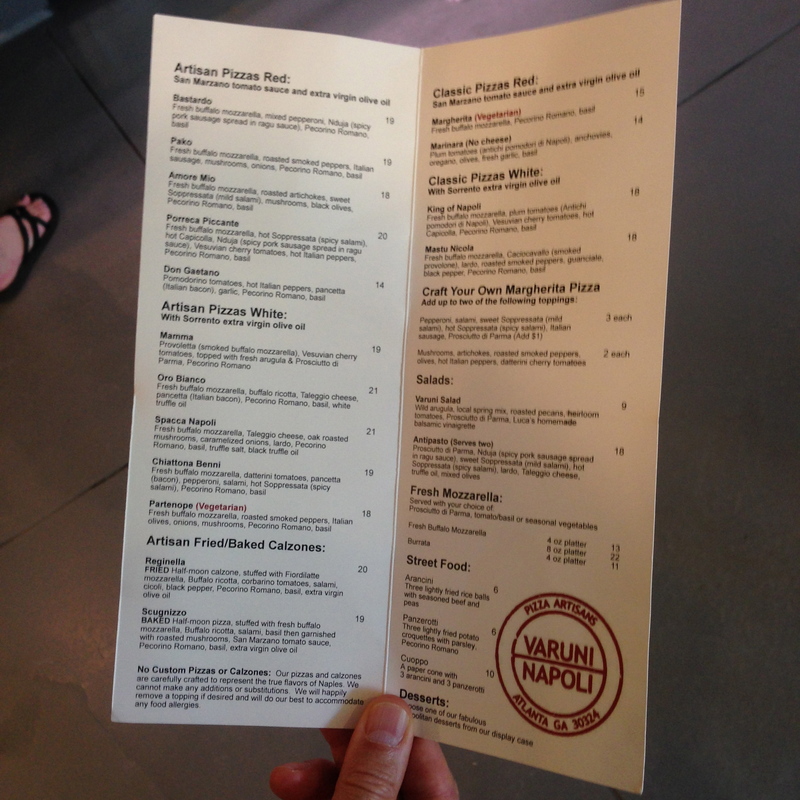 The bottom line on Varuni Napoli: Molto benne! 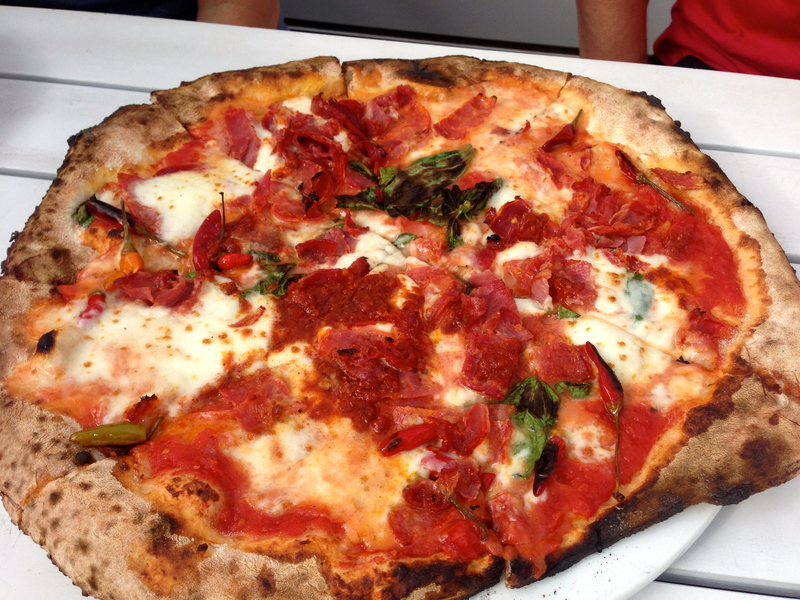 This is Neapolitan pizza done right without the lines at Antico. The toppings are generous and we really enjoyed our pie. The space is very nice and you can sit indoors or out. Go later if you want to avoid the kids, but make sure you go and enjoy some of the best pizza in Atlanta. 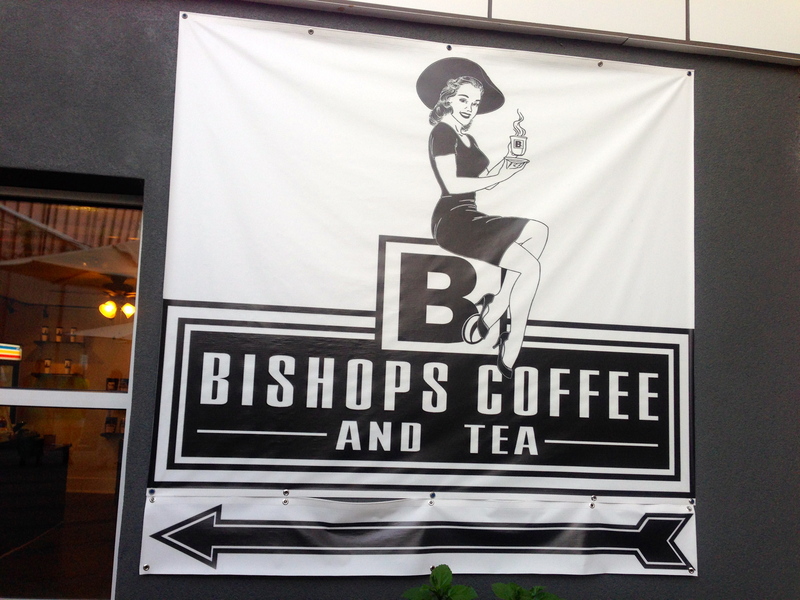 As we are leaving Varuni, we spy Bishop’s Coffee and Tea, which is buried underneath the pizza place. Chris and Shawn want to check it out. 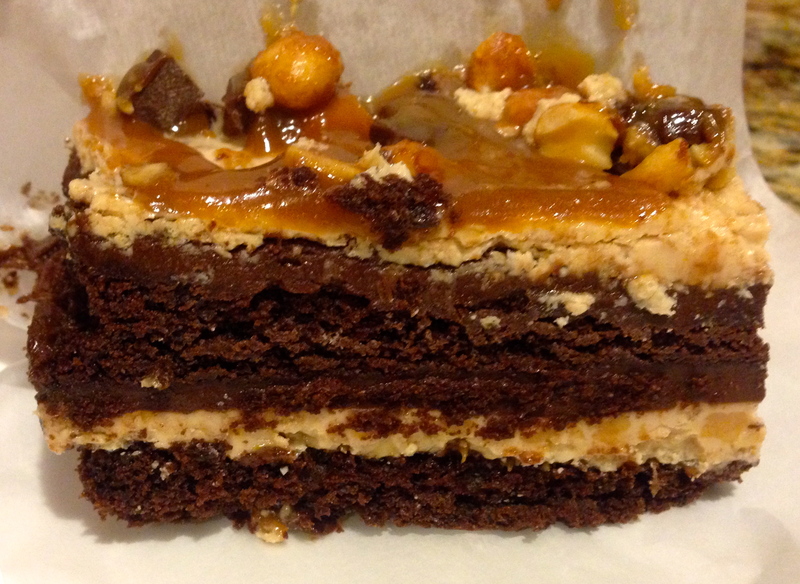 We are not coffee drinkers and it’s too late for tea, but is it too late for dessert? 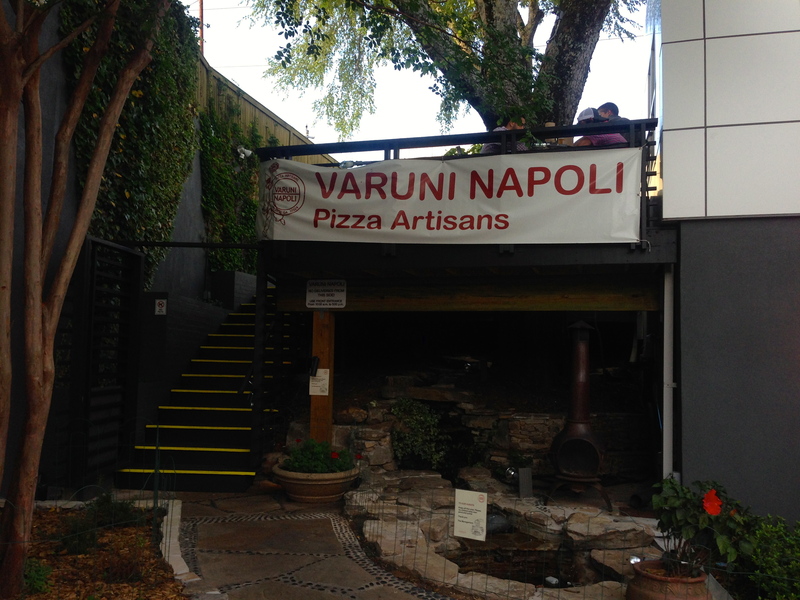 Rumor has it that you get a discount here if you show your receipt from Varuni. We spy the bakery refrigerator in the back and investigate. 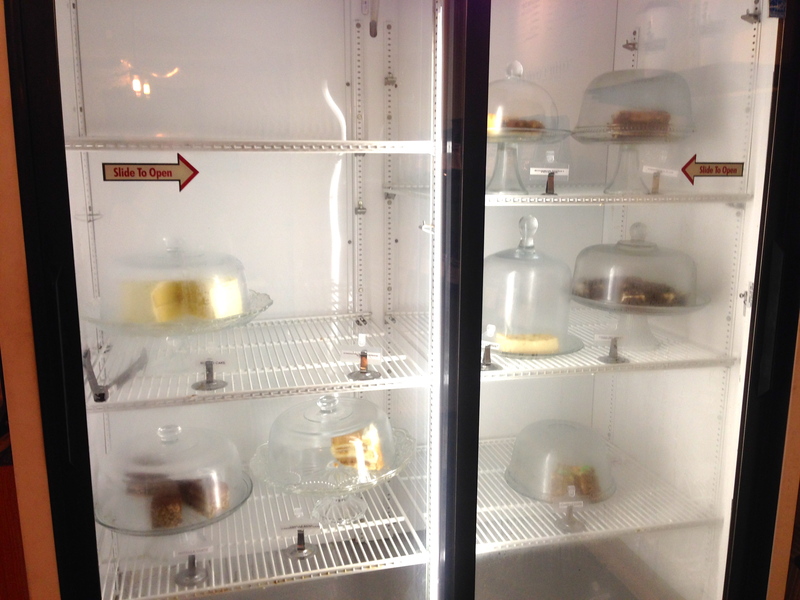 We are too full for dessert, but we can get it to go. The chocolate orange cake is made with Grand Marnier. It’s a chocolate blast that will thrill any cocoa bean lover. 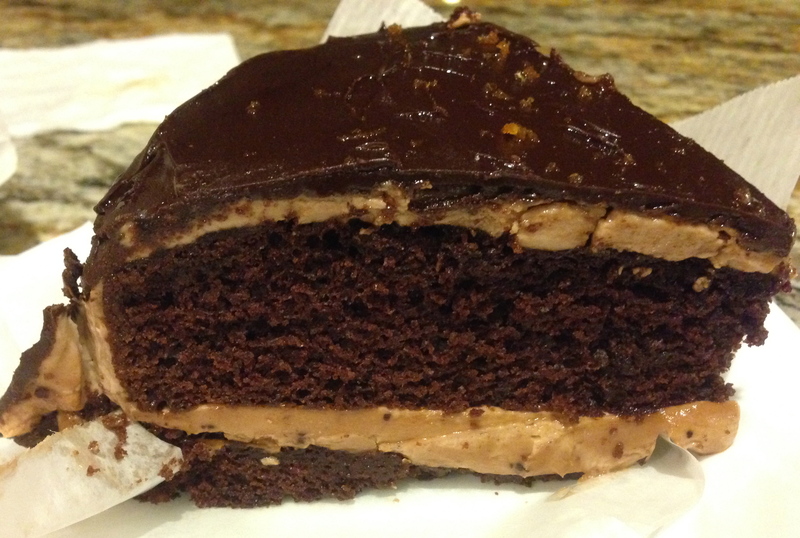 The Snickers bar has chocolate cake, but does not have as rich of a chocolate taste because of the lighter icings. Eve likes this one better. I enjoyed them both. Both cakes are made at Bishop’s. 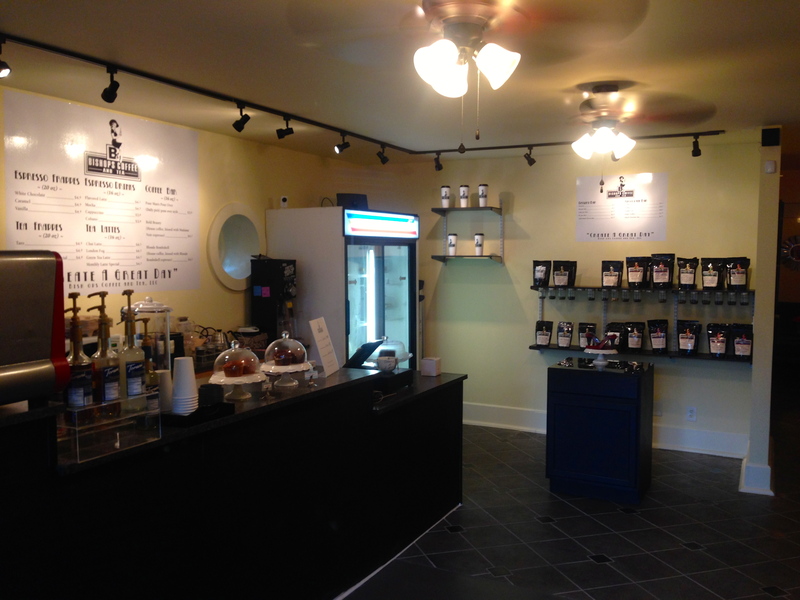 Check out the little shop under the stairs for some great desserts. 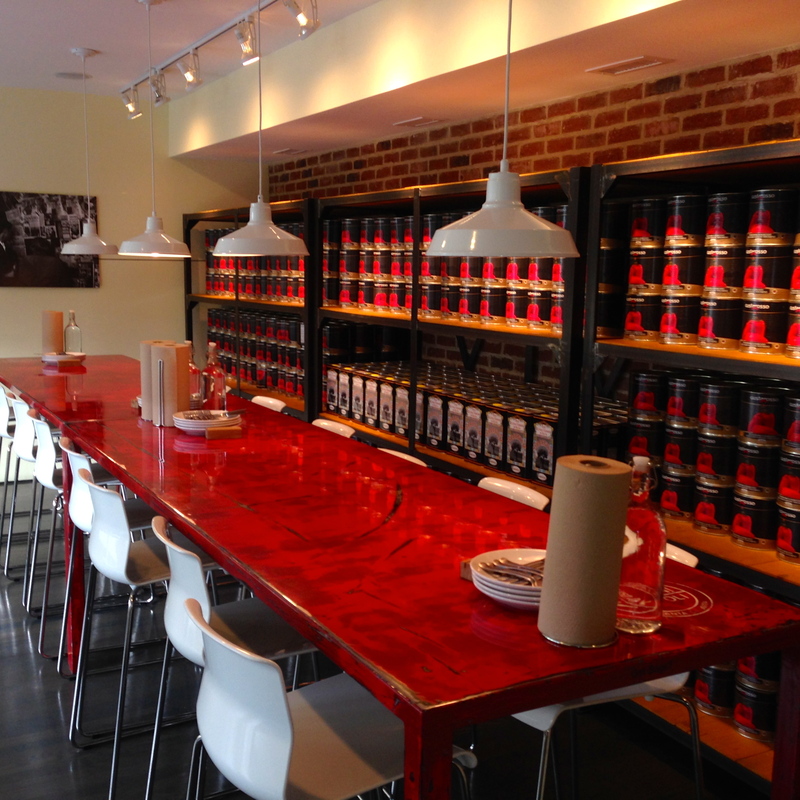 Before we go, check out a guest blog we did for the Taste Trekkers web site. 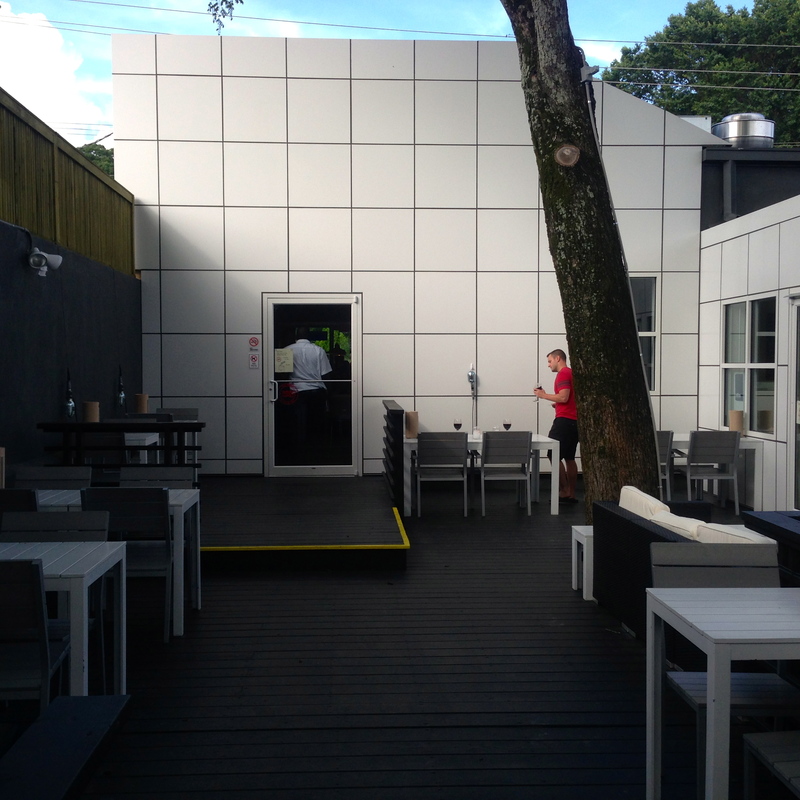 Read all about the Top 5 Places that Beer Lovers in Atlanta Should Go on Date Night. Next Post Lunch Dates: Park Avenue Deli or Kwan’s Korean Kitchen?